Every year in June, as Wilsonville High School seniors prepare for graduation, they reflect on a dozen years of school and look ahead to what's next. One person at WHS — Lyndi Tucker — is doing everything in her power to make sure they have something to look forward to. "If you don't have a plan when you leave high school, that means I haven't done my job," said Tucker, who was hired at WHS in 2006 to run the College and Career Center. For the past 13 years, Tucker has worked with teachers, administrators, colleges, employers, scholarship sponsors, financial-aid experts and others to make sure each WHS student has a plan for the future when they cross the stage during commencement. Most WHS students recognize how lucky they are to have people like Tucker and the other dedicated staff and volunteers at the College and Career Center setting them on their post-high school path. "High schools, depending on staffing and funding, decide how they're going to do these kinds of things," Tucker said. 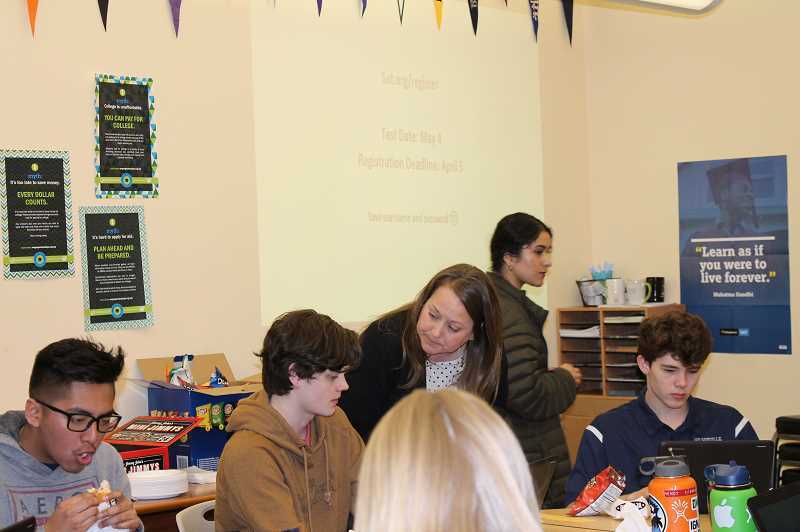 "We're really lucky at Wilsonville High School that our district sees the value in having this position and a room, in addition to the counseling program for college and career. The kids also see the value in it. They're in here a lot." The work of Tucker and the rest of the center's staff has paid off for WHS graduates. "Over 80 percent of our students go to college," Tucker said. "About 58 percent went to four-year colleges last year and another 28 percent to community college." The College and Career Center helps students with college research, hosts visits from admissions representatives, and assists with applications, essays and SAT prep. Every fall, the center hosts admissions representatives from over 40 colleges nationwide, allowing WHS students to learn about the schools and make an in-person impression on the admissions department. WHS also holds the SAT twice a year, organized by Tucker and the College and Career Center. But the center's focus isn't just about college. It also helps students find careers they're well-suited for even if secondary education isn't the right path for them. 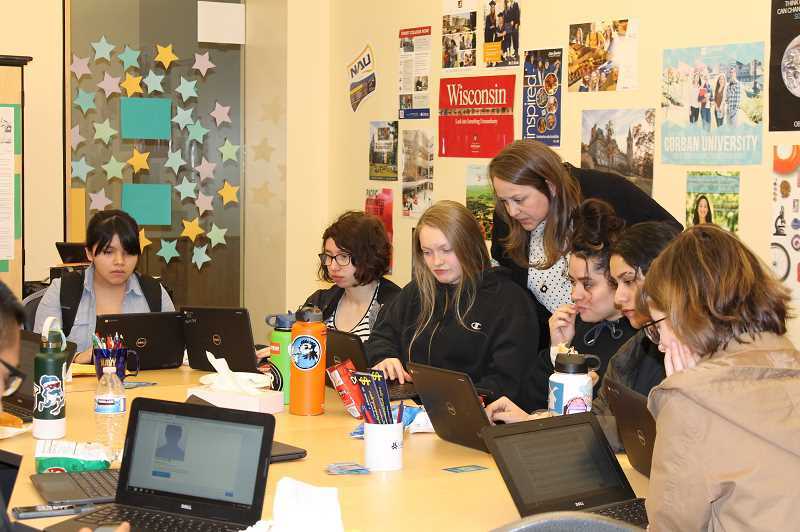 The center uses a program called Naviance to help students explore career options, take personality and aptitude tests, and learn what qualifications are required for the jobs they're interested in. The center also helps students find job opportunities at businesses in the community while they're still in high school. Realizing it takes a lot more than an after-school job to pay for college, Tucker also helps students find scholarships and other financial aid. Once a year, the center hosts a financial aid night where seniors and their parents can learn about scholarship opportunities and the Free Application for Federal Student Aid (FAFSA). Through connections in the community, Tucker also has helped establish scholarships, amounting to around $50,000 for WHS students. "When I started, we had a couple of organizations — the Rotary Club, the Booster Club — that funded scholarships for our seniors. But this year at our senior awards night, the community organizations will give away over $50,000 to our students," she said. Tucker has played a significant role in connecting the money to WHS students by approaching organizations in the community and persuading them to start scholarship programs. She even has helped donors write the applications. The program has grown as word has spread. Many local organizations and businesses now approach her about starting a scholarship, and Tucker does everything she can to help make it happen.